The Grotto is a composite of nine separate Grottos, each portraying a scene in the life of Christ. The Grotto includes the largest collection of precious stones and gems found anywhere in one location. The artistry has to be seen to be appreciated, plus the message it gives is beyond words. It is frequently considered as the "Eighth Wonder of the World." The Grotto has been placed on the National Register of Historical Places in 2001. The Iowan Magazine has described the Grotto as a "Miracle in Stone". SUCH a lie. I'm totally checking this place out! One thing I dread about moving to the midwest is the cold. I don't like cold weather. Despite having grown up in the Boston area, windchill and ice are not my friend. Granted, I did walk half an hour each way to work for at least 4 winters. 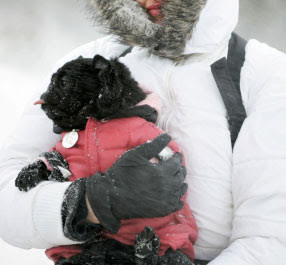 There was that one winter it got so cold people were told not to leave their homes except for emergencies. Rather than listen to this seemingly sound advice, I donned extra layers of long underwear, wrapped my face with a muffler, and popped open several of those self-warming packets you find at EMS. By the time I got to work, the handwarmers were cold and crunchy. Those days of bravery are so over. Now, if the weather drops anywhere below freezing I'll gladly stay home with a cup of tea and my computer. There are perks to being in graduate school. Hunting around the web I managed to find some tips on staying warm in the midwest. However warmth does not equal stylish. This might be a problem. Then again, if it's subzero temps with -80 windchill, maybe I won't care so much about how I look. I actually wouldn't mind a pair of mukluks - they certainly can't be any worse than Ugg boots! There is a pork tenderloin sandwich, made of tenderloin, which is pounded flat, breaded and deep fried, then served on a hamburger bun with ketchup, mustard, mayonnaise and dill pickle slices - sort of like a schnitzel burger maybe? Supposedly, this dish originated from the large German population, which first populated Iowa. Creamed corn is also a local specialty. Well, I suppose this is better than those "hot dishes" made with Cambell's soup. Then again, it's not Chicago either. Tonight I finally had a chance to try out the Hungry Mother, located in Cambridge, MA. After trekking through arctic winds, I arrived at the small, cozy restaurant and was greeted with a napkin to wipe down my frosted glasses. We started off with an order of the Allan Brenton's Country Ham served with 'angel' biscuits and pepper jelly. These turned out to be little mini biscuits, light, buttery and perfect for the thinly sliced serano-like ham. They went down easy like wee appetizer poppers. Next we tried the Shrimp & Grits - little Maine rock shrimp with hm tasso ham, new orleans barbeque, and cornbread croutons. The shrimp tasted fresh and flavorful in the sweet, smokey barbeque sauce. The grits were tasty and not too heavy, and the tiny squares of crispy cornbread added just the right amount of crunch to the dish. I could have licked the bowl. The French Style Gnocchi with foraged mushrooms, kale, butternut squash broth and sage was possibly my favorite dish. The little perfectly shaped gnocchi were lightly, flavorful and perfectly balanced by the delicious mushrooms, the slightly bitter kale and fantastic broth. I loved every bite. The Fried Chesapeake Bay Oysters with 'kohlslaw', tobasco and lemon were also fantastic. They arrived hot and crispy, but light and oyster-y on the inside. My only caveat about this dish is that the breading and tobasco may have overpowered the oyster flavor just a little. We finished it all off with the Lemon Chess Pie with buttermilk ice cream, and earl grey caramel. The pie had a perfect crust - hot, light and buttery with a lemon-curd like filling. The buttermilk ice cream perfectly complemented the slight tartness of the dessert. It was better than I'd expected - and not at all what I'd expected. I would order this again in a heartbeat. And of course, the Hungry Mother is also known for it's classic cocktails. The no. 43 with old overholt rye, 10 yr ferreira tawny port, maple syrup, and bitters was perfectly balanced and delicious. A bit on the sweet side for rye, but the flavors really pulled out that 'rye' flavor, which I liked. There was just the right amount of maple syrup - enough to flavor the drink, but not overpower it. Service was attentive and friendly. I think the owner or maître d' even stopped by to ask us how our meal had been. Be sure to reserve ahead - this tiny spot tends to pack up in the evenings. There are seats at the bar, but I've heard these can pack up as well. Guess what?! 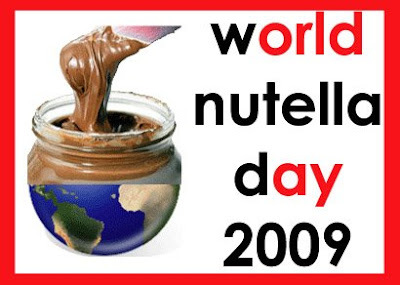 Today is WORLD NUTELLA DAY!!! Find out what kind of Nutella Lover you are on Ms. Adventures in Italy! (I am probably a Spooner or a Dipper.) If you think you have a Nutella "problem" please see Bleeding Espresso for signs of addiction. How decadently sweet is this: a Dom Pérignon LOVE gift pack, complete with champagne glasses designed by Swiss artist, Sylvie Fleury, and a bottle of Vintage Rosé 1998. What better way to celebrate Valentine's Day than with a really really expensive bottle of pink champagne? No worries about getting lipstick on your champagne flute - these arrive pre-smudged! The only drawback to this place is that you are not allowed to sit in the restaurant area unless everyone orders an entree - as a result, later in the evening the bar area gets backed and the tables empty out. We patiently waited until a bar table opened up and then planted ourselves for the rest of the evening. We began with the Caspian Heaven (Russia), with a roasted fingerling potato, crispy, fried oysters, creme fraiche, salmon roe & champagne sauce. This was good. I ate half the plate myself. We also had the classic sizzling garlic shrimp dish, which was very similar to the Dali's version. The shrimp wontons (China) had a mixed following. I loved them - light shrimp filled wonton wrappers, boiled not fried, with a sliver of pickled ginger on top. My friends were not huge fans - the ginger was a little overpowering. The Brie en Croûte, was basically a baked brie in puff pastry with walnuts and bacon. I couldn't really taste the walnuts or the bacon, but the brie was great on the hot rolls that came with our meal. The Duck a l'Orange Crepes (France) were possibly my favorite dish (although I should tell you about dessert) w/citrus & fennel vinaigrette. The duck was moist, flavorful and extremely "meaty" wrapped in a deliciously light crepe with a hint of orange in that citrus sauce. Yum! I avoided the Cuban Cigar, which had beef short ribs wrapped in dough w/black bean salsa. The dish looked unusually phallic and heavy so I stuck with the other dishes instead. My friends were not especially impressed by the flavor of this dish. Disappointingly, the side dishes, a "middle eastern" Rice Pilaf, and Gratin Dauphinois (France), had very unappealing flavors or lack of flavors. I would not bother with these at all. Stick with the warm bread rolls instead.